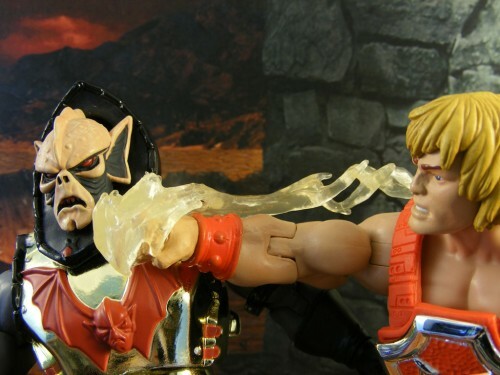 As the 2014 Club Eternia subscription struggles to meet its minimum, there has been a lot of negativity surrounding the way the line has been managed by Mattel. 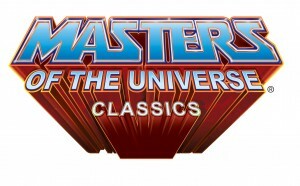 While such discussion is certainly justified, we at PGPoA thought we’d put together a list of reminders of what makes Masters of the Universe Classics so great, and why you might want to consider subscribing if you haven’t yet. 10.) Army builders. 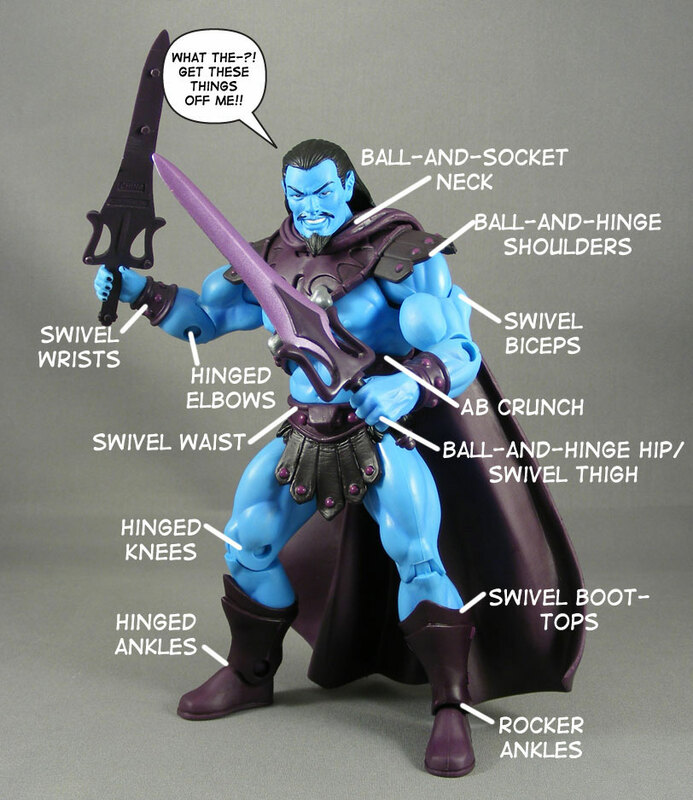 For the first time, MOTUC offers a variety of awesome army builder figures, often with alternate heads and weapons to offer as many custom looks as possible. The Palace Guards, the Snake Men and the upcoming Horde Troopers are all excellent examples of great army builder action figures. 9.) Thunder Punch He-Man. Because PUNCHING. 8.) Castle Grayskull. Everyone loves a good playset and a big chunk of that is our nostalgia for all the cool ones we had growing up. Sadly prices have risen and demand has fallen so the once staple of the our “play pattern” is all but lost to us forever. 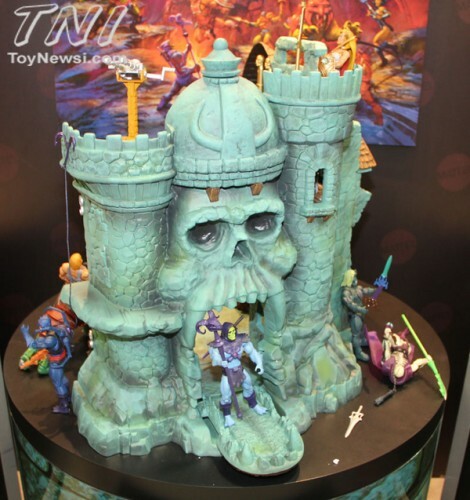 Well, after several strong years of figure sales MattyCollector did the near-unthinkable and brought us one of, if not THE, most iconic playset of the 1980s – Castle Grayskull. And what’s more, they did it IN SCALE with the 7” figures of the line AND reconstructed the full playset – not just the front wall or the drawbridge by the full kit ‘n kaboodle. Sure there was a lot of controversies around this piece at every step of the way – heck, it IS MOTUC after all – but the fact remains that the biggest toy company on the planet tried something new and innovative for such a major corporation – and it succeed. Nemo Eight saw the castle in person at SDCC and was totally blown away by it. This is absolutely the crowning achievement of the line and this will be the centerpiece of any display. The MOTUC Castle Grayskull is the most unique of all modern toys. It is a reason to rearrange your furniture because it is too cool and impressive to NOT have on display! We’ll never have a 6” scale Millenium Falcon or Colonial Marines APC or Star Trek Shuttlecraft, but by gum – we have the power! We have Castle Grayskull! 7.) Vikor. 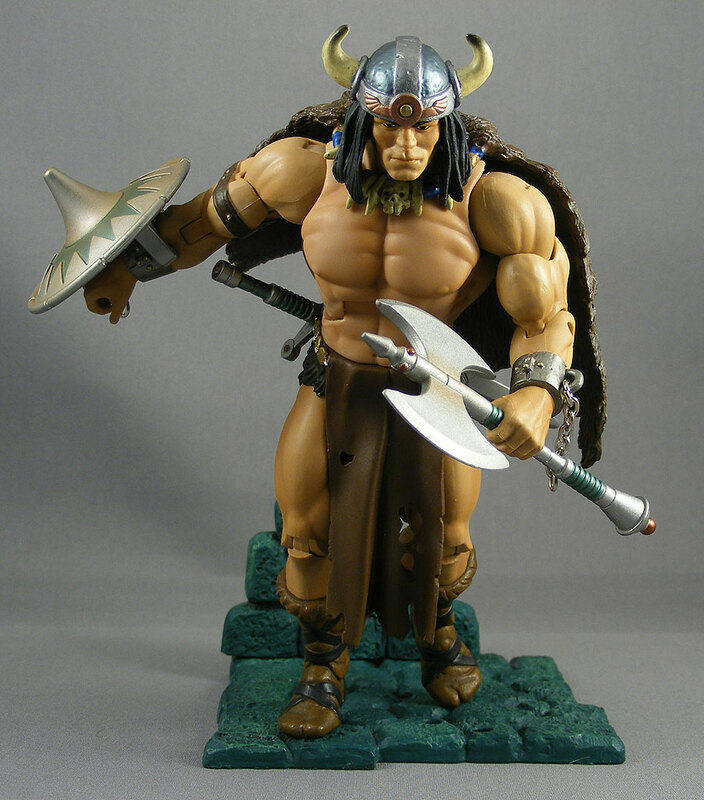 Considered by many to be one of the best, if not the best MOTUC figure, Vikor is essentially the Four Horsemen’s take on Conan. 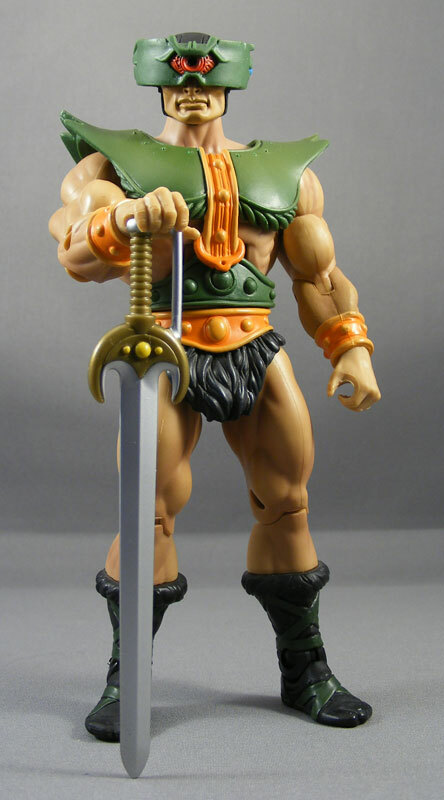 With a fantastic sculpt with lots of new parts and some excellent weapons, Vikor won over even the most diehard fans of other MOTU media as well as drawing interest from many non-MOTU fans. He is perhaps the best barbarian action figure ever made. 6.) Weapons Packs. There were weapons packs in the vintage MOTU line, but never anything like the ones we got in MOTUC. While many of the accessories were repaints, they were often repaints that made sense or looked even better than the “normal” versions, and the sets often contained unique – and awesome – items, such as Man-At-Arms Millennium-era arm weapon and Keldor’s split swords. 5.) The Four Horsemen. 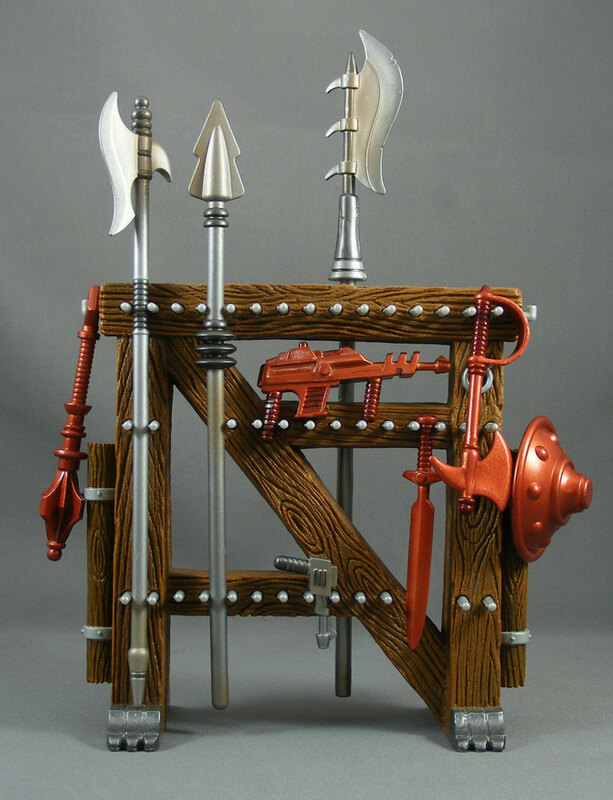 Nearly every single MOTUC item is designed and sculpted by one of the best design studios in the business, the Four Horsemen. Not only are the sculpts excellent, but the use of a single studio allows the line to maintain a consistent look across all eras and factions (although there has been an overly cartoonish element creeping in with some of the Filmation characters). Hinged ankles, with varying degrees of back-and-forth “rocker” motion. While it’s true there were sometimes issues with the articulation (particularly the ankles), it was still great to finally get this level of articulation on a Masters of the Universe line. 3.) The Beasts. The vintage MOTU line had its share of large monster toys, but it was left to MOTUC to provide some of the greatest examples of them. In addition to fully-articulated Battle Cat and Panthor, fans got the never-before-released-in-North-America Tytus and Megator, as well as new additions such as Gygor, the Shadow Beast, and the Griffin. And of course, the mother of all beasts, Granamyr. 2.) Previously-unproduced characters. It took thirty years, but Mattel finally carried through on its promise to produce Nathan Bitner’s Fearless Photog. Even better, figures like Draego-Man and Castle Grayskullman came along for the ride (and yes, the Mighty Spector and Sir Laser-Lot too, but the good outweighed the bad). And we even got figures of characters who were made into prototypes but never produced, such as He-Ro. Now where’s my damned Eldor? 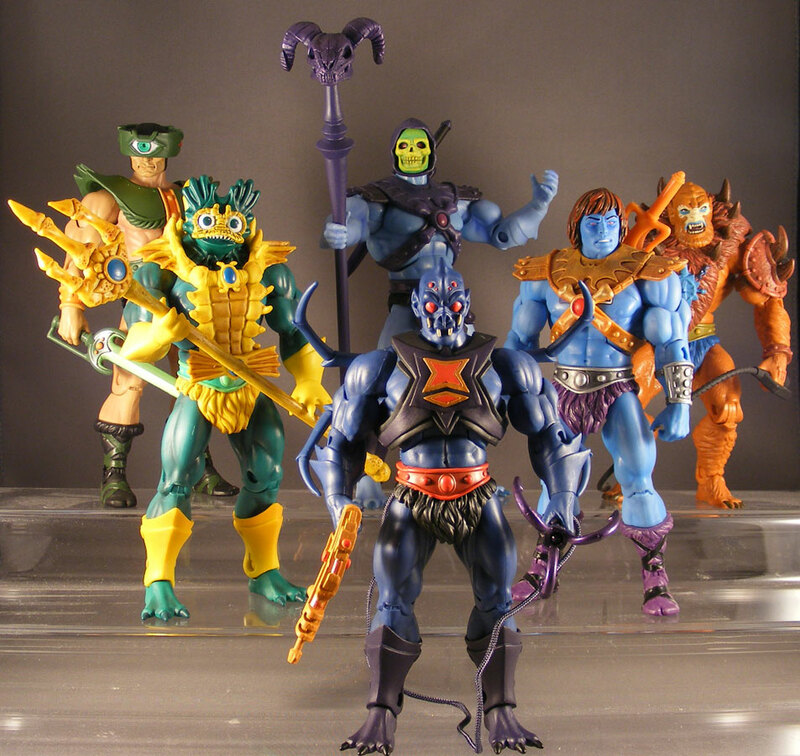 MOTUC is THE Masters of the Universe line. 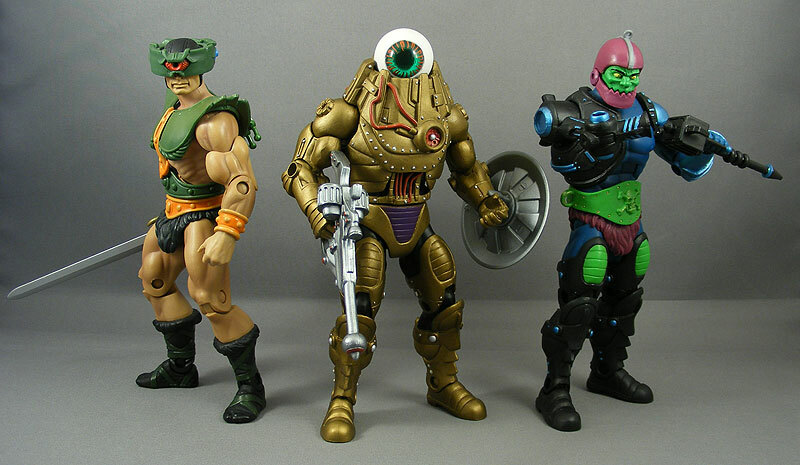 Although some can (and will and should) argue about the distribution method and the scale, this toyline has produced more excellect action figures of more MOTU characters, reaching deep into all the different incarnations and versions of the mythos, than any toyline preceding it. This extends beyond the characters into individual artifacts made into accessories, army builders, vehicles and larger creatures, all of which have been worked into the mythos. So while you may not like the way the bios went about incorporating all these different factions and eras into the same universe, we’re still lucky to have such a massive character selection from across the entire history of Masters of the Universe. I would humbly add alternate heads to the list. Mer-Man, Alcala Skeletor, mustachioed MAA, Whiplash, Adam, etc. That was an excellent idea and well-executed. An Unhelmeted Vikor would have been great! I agree, same for MAA. Now I really want a Mustachioed He-man too! They should just release a whole figure, and give him the hairy Zodac chest too! I would buy that in a heartbeat! Handlebar Mustache He-Man with hairy chest! I have been collecting Neca (great toys), Dc Direct or Collectibles and Marvel Selects, but in my opinion Masters of the Universe is the best line ever made. I have more than 120 figures (including beasts) and the Wind Raider, and I think we will never see something like it again (only Gi joe collectors or Star Wars collectors have more then motu collectors). I know they have some problems (Mattel) but in my opinion Scott has donne a fantastic job!!! If the subscriptions was the only way keep the line alive until now I have no problems with this and I have already bought my 2014 subscription because I want more. Prince Adam, Vikor, Shadow Waver, Palace Guards, Jitsu, Fisto, Demo Man, Clamp Champ, Castle Grayskull Man, Fang man, Webstor, Scare Glow, Panthor and Battle Cat, Catra, Procrustus, Ram man, Snake face, Cobra Khan and Snake man soldiers are some exemples of my favorite toys in my house!! and WWE collectors…if you love wrestling, mattel has done you well, jakks did you fantastically well. MOTUC cheer leading here now too? 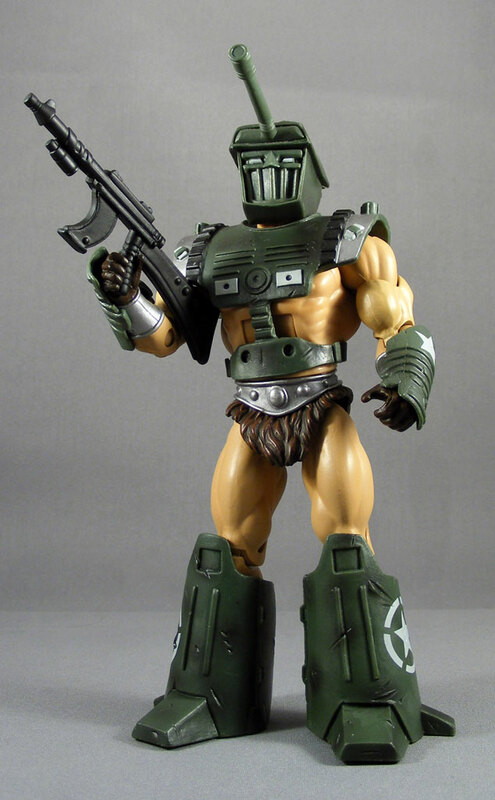 I think, despite some strengths, that MOTUC is probably the most overrated line out there. "Nostalgia" really ought to be on the list, because that's responsible for selling more figures than anything else. I agree that it's overrated, although I can see why some people go crazy for it. It's been LONG overdue for a toy site to finally state the mind-bogglingly obvious, & I commend y'all for doing it. I'd say "fan involvement" has been one of the really nice things about this line. 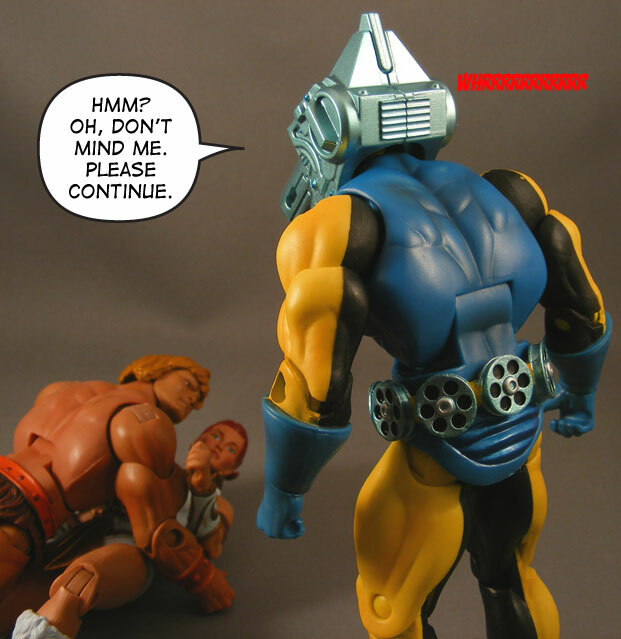 With all the customizers out there, Mattel answering fan questions, the create-a-character fan contest, and the fact that Power-Con rose up right at the peak of this line. My Draego-Man gets to stay on display on the shelf even when the rest do not. As good as this list is Poe, sadly it would be very easy to put together a list of points why a lot of fans have lost interest in the line. How Dare this site be positive! That used to be a regular feature. To get a new figure from this line just about every month, for so long, has been really awesome. 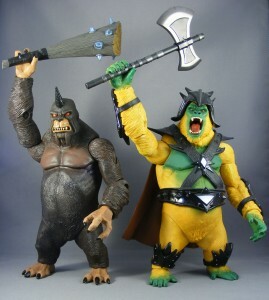 Seriously, I've bought half a dozen MOTUC figures this month, and they're all pretty good! And even if you paid full price for them new…why not get another? For ten bucks, do some head swaps! Army-build Icarius! Try your hand at customizing! Have a bit of fun, why don't you? And if you pay attention to the Matty forums, at least one guy became aware of the line and turned into a new fan thanks to Big Lots. It's a great chance for new people, and especially kids, to get into the line. 200x is even on Netflix for them to watch. Big Lots is a big opportunity, not a curse as some might think. Big Lots is the reason I'm considering subbing this year. I've been on a MOTUC slump for a couple of years, picking up a couple of figures here and there. I was able to fill a few holes in my collection for cheap, and it helped me remember how much I like the figures. See, it's posts like this, that to me, proves how "sour grapes" the fanbase is sometimes ("If I can't get it, I don't want you to get it") and how the few outshout the many. Once you strip away the fandom and the hype machine, you're left with the toys- and they are inspiring, fun, quality, diverse… the line is hands-down one of, if not "the", best toyline of the 00s. They sell themselves- they don't have to use fans against one another to make money, they're that good. And…I just subbed. I never thought I would, but I'm looking forward to fleshing out my MOTUC world with characters that I know little to nothing about. Honestly, I got all my must-haves a while back, but I have found recently that a lot of these secondary characters, and figures that I initially was not interested in, add some real nice flavor to my collection. This happens a lot. I didn't collect WWE Legends, didn't even really know about the line, until the big Target unload. Been buying those and ow Elite Flashbacks ever since! Good point. I discovered this week, someone on He-Man.Org bought every MOTUC at four different stores in my area and posted some pictures of his ridiculously huge haul. Everything of course showed up in the B/S/T section and on his eBay for $20+ each. He already had all of these figures, and was just scalping- no one called him on it, on either of the forums he posted his haul pictures at, which to me is telling. it's telling that in the list of ten awesome things you include grayskull which hasn't even come out yet so probably should not make the list based on that alone, because there's always a chance (however minor) that it may not come out, and there's a much larger chance that the grayskull you get may not live up to your expectations, even if you're forgiving matty for every flub along the way. just kinda silly to say "here's one of the awesome things about this line: something that hasn't been released yet and has already gone through several changes and is likely to go through even more before being released, so it's impossible to judge! but still belongs on this list somehow!" I saw what went down with the Hoverboard, and the disappointment people had when that shipped, and I took the chance anyway. You can't look at that Hoverboard situation and seriously think this preorder would be any different; it would be foolish to thing they wouldn't mess with it in some way, for cost. While BTTF fans did have somewhat unrealistic expectations on the piece, they did cheap out on the end product. I am expecting them to do the same with Grayskull, pulling things like the backpack or the weapons, with the parts they pull coming in a weapon pack next year; or making the paint simpler. I put my preorder in expecting them to mess with it, so I wasn't disappointed when it happened. I put my money down on a Power Point slide 🙂 I can't help but think anyone putting down the big bucks for one, knew about Hoverboard too, and didn't set the expectation bar too high to begin with. are you trying to say that to enjoy the toy, you have to expect the worst? cuz that's kind of how this reads. that is definitely not how i view a 300 purchase. if i went and spent $300on a TV, i'd expect more than the absolute worst. so yeah, i expect more than that from castle grayskull too. I'm saying, I knew what I was getting into… I bought a $300 toy based on a Power Point slide, with the caption "Subject to Change" in the fine print, and the company selling it had just a few months before hit a huge wave of bad press for not delivering to fans a quality item on a similar preorder. I knew what I was getting into before I put my order down. It's not exactly the brightest of moves, so I have only myself to blame if I overexpect things from it- the writing was on the wall and it would be foolish to think they wouldn't change something before 2013.
brr… it's a little chilly in here. Great list-I’ll bet it was hard to narrow it down to 10. The MOTUC line is amazing. Sure it’s had its problems (though I’d venture a loud vocal minority of whiners-there I said it-is among the worst if them). Sub up with us, gang! The next 2 years are going to be amazingly exciting for He-Fans and She-Ravers! Lets really kill the numbers so we can convince the Suits upstairs in El Segundo to allow Snake Mountain, mini-subscriptions, and more of the extra goodies that help make MOTUC the Best Toyline Ever!!! Are there really people who army build $30+ figures? I have seen some people army build Macross Valkyries which go for well over $100+ each. There are people who will army build anything. not trying to be captain negative… there are those guys and i truly don't number myself amongst them… and openly acknowledging that some of the above listed facts are true… the issue is, for the price you pay, the piece you get is simply, often, not worth that price. but every positive note on that list deserves a caveat… that is not a great toy line, not in an overarching sense. like "hey, it's got great articulation… not industry leading articulation, or particularly stable or well constructed articulation, and sometimes, it has better articulation than the outfits the figures wear allow them to use… but it has articulation, we can definitely say that!" or "it's sculpted by the four horsemen, who do better sculptural work on almost every other line of toys they've every touched, going back into the 90's. 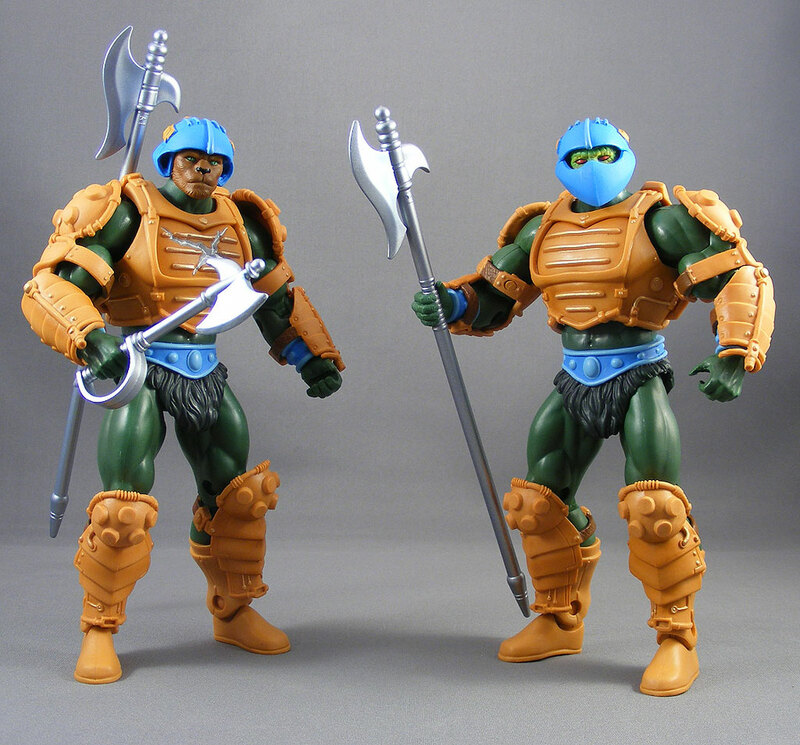 a lot of those had better paint too… and some of the very best pieces that stick out as hallmarks of motuc sculpting were actually sub-sub contracted to a not-horsemen friend of theirs. but hey, it was sculpted by the horsemen!" if gets hard to see the silver lining for all the big dark clouds. there is a silver lining, to be sure… but how much cloud must be ignored for us to genuflect? The things you're saying here have merit, but for me, the fact that it doesn't have "industry leading articulation"… or that the 4H use a fifth or sixth Horsemen there once in a while… these things are so small compared to the other things listed in the article. Personally I think the articulation is fine (but I do like your lioncloth trick!) and I tend to like the 4H stuff regardless if it's not strictly done by one of the four founders of the studio. The pluses far outweigh the minuses to me. I totally remember the people who were irate about King Grayskull not being large enough. Some of them are still irate about the same kind of stuff to this day. Makes you wonder why they collect the line in the first place. i've wondered that too… man, i've certainly had my issues here and there, and i can appreciate that my circumstances and situation collecting the line have not been universal, but if i had the seemingly hellish experience some collectors rant about, i just flatly wouldn't be buying the line. i passed hugely on 200x because i bought 4 of the toys and was unimpressed. did i miss some cooler pieces later? maybe… but i didn't have a collection of stuff i regretted either. as for my loincloth trick… there is an aspect there that is kind of the synopsis for why the line has bugged me. we're finally getting loinclothes soft enough that i don't have to do that trick religiously with every release i buy anymore… but i've had to develop a "soft armor trick" for trimming the soft armor items to get their arms to go down. why do i have to do that? they got soft armor right on he-ro for godssake, why did they fudge it up on snakeface where it bulges and isn't formfitting? and therein lies my larger issue… it's always something. they just can't score a 100% success in this line, where you sit back and go "hot holy hand grenade, that is one fine toy!" i've had that in a number of other toy lines i've bought into in recent years, where one fig comes out just perfect, i couldn't have hoped for a better piece. in the end, the horsemen outsourcing a couple heads or the figs having floppy ankles are not, by themselves, egregious (though motuc, thanks mostly to it's talking head, has had egregious moments), but they are zits are a pretty girl… and try as you might to objectify the girl, you just can't get past the acne. I totally see where you'er coming from. They are so, so close to perfect, and those little "Doh!" things like weak ankles or small heads can be a bummer. Like, for me, they did Vikor and that figure to me is 10/10. So even if nothing further they do is perfect, I know they did one that was the best they could possibly do, to me, on several levels. Everyone has their pet peeves and preferences- but in the end we all want and enjoy the same things. I'll knock Scott for the hard sell, but his oft-repeated "Take a look at your shelf…"- that is very true. My display case full of hairy underwear dudes looks great, I have guys like He-Ro that when I first got into MOTU again as an adult in the 90s I thought I'd never see or own, and there's something for everyone. I want to know more about the loincloth and soft armor trick, is that posted somewhere else? Having armor that is too big and bulges out bugs the heck out of me. Some figures (like Dawg-O-Tor) have it fitting perfectly, and others (like NA He-man) just have it too dang loose. I don't know why that can't be consistent. I've several times almost started cutting in to NA He-man's harness and had super glue ready to try and get it to fit better, but it's harder to do something like that to a $35 figure than it is to an $8 G.I. Joe. I did it to an extra Palace Guard I had, it worked really well. I think the articulation is fine on these figures, mine mostly stand straight in my display case so no biggie for me. But Dayraven's trick lets you get really deep stances, more arm movement, and they sit much better too, if you're a joint junkie and need a little bit more yoga on your He-Men, really worth a try. thanks for reposting that link RZ. i will offer this tip, on the armor pieces, if you're doing the arm area, cut at an upward angle, like you're slicing from the bottom of the armor with your knife/blade aimed at the guy's neck, that angle will help you from having to remove as much material. i should also point out, when i said just above center on the loin cloth, i mean above the center of each thigh, just where the loincloth transitions from long center piece to shorter piece above the leg. those cuts really help free up the thighs, and moreso on the stiffer loincloths.